He had the home court — home kitchen? 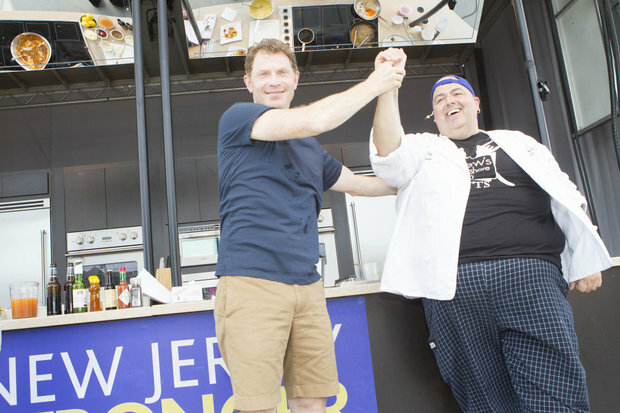 — advantage, and he had killer cornbread: Andrew Araneo of Drew’s Bayshore Bistrotriumphed over Food Network star Bobby Flay in an informal throwdown that drew more than 1,000 people to the Keyport waterfront earlier today. AT Drew’s Bayshore Bistro in Keyport, the chef and owner, Andrew Araneo, cooks the happy, brash dishes of Louisiana and the Carolina-Georgia coast: crab meunière, gumbo, shrimp and grits, crayfish, jambalaya and étouffée. Join Drew Araneo of Drew’s Bayshore Bistro as he prepares one of his many specialties, blackened cajun sirloin. A true professional at the art of blackening, Drew suggests you might not want to try this at home. Watch the video to see why.